“Lydie Solomon is nothing if not well prepared. 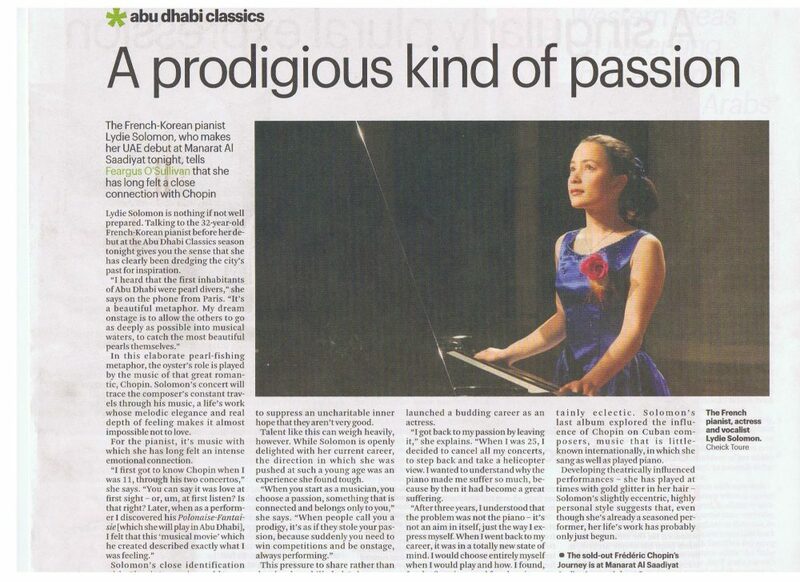 Talking to the 32-year-old Franco-Korean pianist before her debut at the Abu Dhabi Classics season tonight gives you the sense that she has clearly been dredging the city's past for inspiration. In this elaborate pearl-fishing metaphor, the oyster's role is played by the music of that great romantic, Chopin. Solomon's concert will trace the composer's constant travels through his music, a life's work whose melodic elegance and real depth of feeling makes it almost impossible not to love. For the pianist, it's music with which she has long felt an intense emotional connection. Solomon's close identification with Chopin's music could stem from the similarities between their lives. Both are constantly travelling musicians who are strikingly different from most of their contemporaries. First spotted as a musician when caught playing Beethoven by ear at the age of 2, Solomon was only 10 when she made her professional debut. Her first national prize came at 13, and she won top prizes twice at the Paris Conservatoire. She also has an MBA and speaks four languages fluently. When she shyly admits she's written four unpublished novels – the first one at the age of 12 – I have to suppress an uncharitable inner hope that they aren't very good. Talent like this can weigh heavily, however. While Solomon is openly delighted with her current career, the direction in which she was pushed at such a young age was an experience she found tough. This pressure to share rather than develop her skills led Solomon to take a three-year musical sabbatical in her twenties, during which she launched a budding career as an actress. “I got back to my passion by leaving it,” she explains. “When I was 25, I decided to cancel all my concerts, to step back and take a helicopter view. I wanted to understand why the piano made me suffer so much, because by then it had become a great suffering. This latter-day career is certainly eclectic. Solomon's last album explored the influence of Chopin on Cuban composers, music that is little-known internationally, in which she sang as well as played piano. Developing theatrically influenced performances – she has played at times with gold glitter in her hair – Solomon's slightly eccentric, highly personal style suggests that, even though she's already a seasoned performer, her life's work has probably only just begun.